Is this the omnidirectional treadmill you need to buy now? Find out here! One of the main things that really adds to the immersion of a VR experience is an omnidirectional treadmill. Today we’ll be reviewing the Wizdish ROVR 1. VR games can be very enjoyable when you’re using a controller for movement, but moving with your own feet is something spectacular when you experience it for the first time in VR. Many have heard of omnidirectional treadmills and seen them in videos in the past 2-3 years, but not many products are out and available yet. Wizdish ROVR has been an available product from 2016. They are readily available and the deliveries are fast, so obtaining one is not a problem if you feel the need and have about $700 to spare. Of course, one of the most important things when it comes to treadmills is the fitness aspect. You can burn calories while experiencing virtual reality. I obtained mine in February 2017 and I had no real trouble learning how to walk on the platform efficiently. I use it with the HTC Vive and personally I have burnt over 20,000kcal using it so far. When I was recovering from an ankle injury obtained at an obstacle race in 2016, it really felt that the ROVR made the recovery process faster for me. In April, I completed the whole Doom 3 from ID Software moving my character with the ROVR 1. The Wizdish ROVR 1 features a slippery disc that you walk on using a special pair of shoes featuring slippery studded soles that are one size fits all. You have a containment frame around your midsection, but you are not secured to it. When starting to use the ROVR you might need to use the containment frame for support, but as you get more experienced with it, you are very likely to get used to walking on the slippery platform. One downside of the containment frame design is that when you enter and exit the ROVR, the whole containment frame structure loosens over time and might collapse if you don’t re-fasten the belts that keep it together. The ROVR disc is not flat, but has a slight concave to it and like the studded soles of the shoes, making it very slippery. You generate movement in a VR game or simulation by sliding your feet across the surface more or less like you were skating. The pattern is a bit different from normal walking motion, but you don’t really pay that much attention to it when you’re in the game and have objectives to accomplish. If you’re wondering how the ROVR translates your sliding feet into in-game motion, it’s done using sound. There’s a microphone under the disc which picks up the vibrations, and the device integrates with the computer and game’s audio system. Just remember to check your audio settings to mute extra microphones because background noise or unwanted sounds may affect your VR experience if the audio capture program detects them. There are no delicate sensors to break, or a web of cabling underneath that could get damaged. According to WizDish, the shoes are equally strong. With 6,000 hours of use on a test device, I only saw the upper parts of the shoe begin to show their age. The ROVR is tough, compact, and compatible with many games, because the fundamental idea of the device is that it doesn’t need to have specific game support. As long as you have a working sound card in your computer, ROVR, shoes, cable and the game supports keyboard input, you’re on. 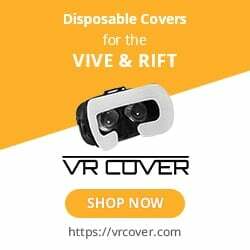 If you want to try and see how it feels to use your own feet to move in a virtual reality environment, Wizdish ROVR is an easy and reliable option at this point. On the other hand, the $700 price tag on top of a VR ready computer and a headset to go with it might make you think twice. Second generation Wizdish ROVR, the ROVR 2 was launched in April and is available for orders. I am Ville "Scie" Piispanen, the mind and body behind VR project Evacrity. We provide physical VR content and we're always after maximum immersion and proper workouts when in VR. Shooters and boxing games are currently my main focus as I am an experienced competitive fighter, fitness enthusiast and soldier (not currently in active duty due to my project). I add all kinds of elements to make VR gaming sessions harder and tougher, use of heart rate monitor and legitimate combat gear for added weight could be called my signatures.